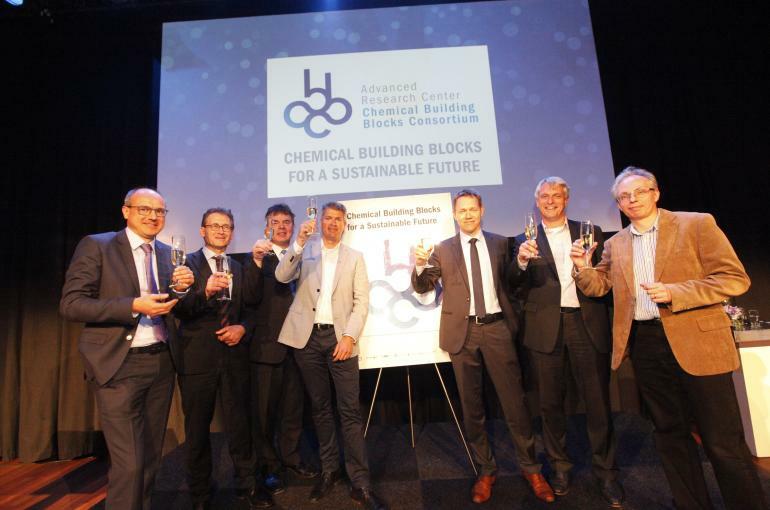 The Advanced Research Center Chemical Building Blocks Consortium (ARC CBBC) officially started with the symposium ‘Chemical Building Blocks for a Sustainable Future’. During the symposium, ARC CBBC brought together potential participants from science and industries for the ARC CBBC research programs. The aim was to inform about the Advanced Research Center, to facilitate encounters between the brightest and best in the field, and to spark new cooperation. Left to right: Bert Weckhuysen (UU, scientific director of ARC CBBC), Ben Feringa (RUG, chair of ARC CBBC), Hans Kuipers (TU/e), Marcel Schreuder Goedheijt (AkzoNobel), Robert Terörde (BASF), André van Linden (AkzoNobel), Adrie Huesman (Shell).